I seem to be developing a little routine for myself, starting the morning with a wonderful coffee and scone at Cullercoats Coffee followed by a walk along Tynemouth Long Sands. I’m still a bit of a fair-weather walker at the moment although I do remember times when I loved having a good stomp along the beach in the middle of a blizzard – really rather exhilarating! Now I’m enjoying a more sedentary walk along the beach in the sunshine, having a plodge in the sea as I go. So where does the mindfulness and coaching fit in? Well both have taken on more meaning and focus over the last week or so. I took a nasty tumble when out for a walk last week and it seemed to knock my confidence somewhat. Or rather, I allowed it to knock my confidence. When I got home I had a few tears and it felt right to just allowing myself to experience it. I did notice that there were some negative thoughts jumping in, that mischievous mind monkey was trying to get in on the action as always. Instead of entering into a fight with him, I welcomed him and gently explained that whilst I knew he was there for a reason and had an important message for me today he would need to state his message in a way that the truth of it was clear and authentic because what he was saying now wasn’t helpful. He chattered away as monkey’s do but it ceased being so negative. Great! This is continuing to work for me and I feel very grateful. Over the next couple of mornings, I began to notice a reluctance to go out, a reluctance to leave the house. Hmmmm, time for some self-coaching focussing on what I wanted to achieve that day, what steps I needed to take to achieve it, what it meant to me, what was important about it to me. 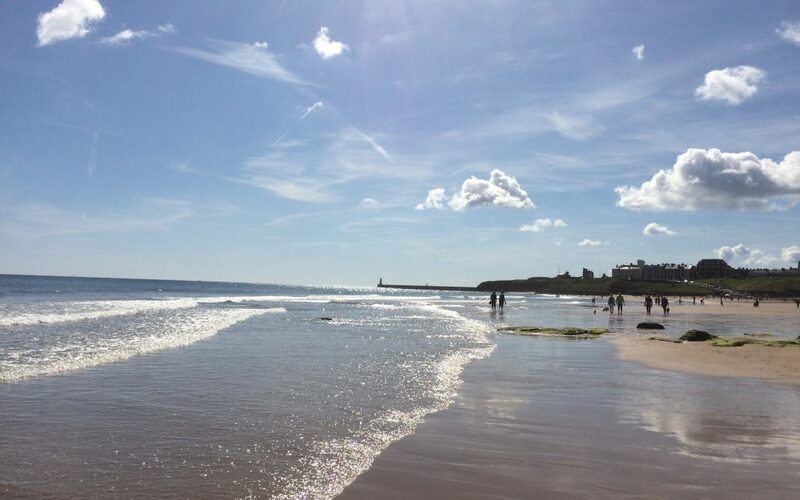 Off to Cullercoats coffee – a great way to set myself up for the day! Sunday morning was particularly lovely – I was a bit early so sat outside in the glorious sunshine watching the world go by, just allowing myself to become more aware of the warmth of the sun on my arms. Closing my eyes and just experiencing the moment. Not being lost in it, that wouldn’t have the same level of awareness, I was noticing, I was being completely present in the moment. It was incredible, I was beginning to notice the little changes in warmth on my skin, the differences in the sounds I was hearing, noticing how my breathing was changing, deepening, relaxing; noticing the changing temperature of my breath as it passed through my nostrils. I could go on and on………… ha ha you may be thinking ‘you already have!’ I was aware that I hadn’t experienced this as fully before. Just allowing myself to be. Not in a planned or contrived way, just allowing it to happen naturally and going with the flow. This then led me to notice more when I enjoyed my coffee and scone. To focus on them rather than my book or laptop. It is quite remarkable how much more I enjoy the coffee and scone when I’m paying attention to it; when I’m aware of and noticing each sip or bite. Please note that I do not sit and stare at it for 10 minutes as is recommended with a raisin by some. I simply focus on it, focus on the flavour, the texture, the different reactions within me as I enjoy it. Next stop, the beach! I headed for the water, determined to have a paddle in the water, the tide was out quite a way which was lovely. I stood just watching dogs chasing tennis balls into the sea; I love the way they always wait until they are right beside their owner to start that full shake to get rid of the water – teehee. I walked a little way into the waves and simply stood and watched the waves. Standing and noticing. Standing, noticing and breathing. With each breath just becoming aware of the water on my feet and ankles, becoming aware of the sensation of my foot sinking into the sand, not progressing this noticing into any further thought about it, just simply noticing and allowing myself to notice a little more. I really don’t know how long I stood there. I don’t suppose it matters. When I started to move again, I noticed something else about my noticing. Whilst I had been noticing, I did not notice any pain. Yet now, as I moved I was fully aware of it again. Hmmm. I know from experience that standing still can cause excruciating pain in my hips and back. Yet I did not notice it. My focus was elsewhere. Now that I wasn’t fully in the moment I was feeling pain. I wasn’t noticing it, I was thinking about it. I stopped and stood facing the waves once again allowing the sea to lap around my feet, noticing my breath as I felt it’s impact as I breathed in and out, noticing the warmth of the sun on my back, the warmth of the seawater swirling around my feet, noticing my toes wiggling in the sand and seawater. Then moving from my toes slowly noticing as I stood and carried out a body scan just noticing what was happening in my body. As my attention moved to my hips I noticed a tension, I noticed a tightness and I noticed pain. I could feel this starting to develop into further thought, so I allowed the thought to drop into the sea and drift away with the tide and returned to simply noticing. There certainly seemed to be a connection between the level of pain registering within me and when the noticing turned into thought about the pain. Yet when just standing there, I seemed to simply notice and found it much easier to let thoughts drift away without connecting with them. I tried next to combine walking and noticing and I did find this more challenging and effortful, nothing wrong with that of course, anything worth learning requires effort. I did notice a change though. The less I allowed the thoughts to develop and the more I kept my focus on simply noticing, the less I was aware of the pain. Of course, this doesn’t remove the pain, and I know that the pain can sometimes hit a level where this approach alone will not suffice. What this has given me is the confidence to know that, when I’m out and about, I can manage my pain levels better than I had realised. As a result, I feel a greater sense of freedom and control. It means I have something else to draw on to support myself in living and enjoying my life and for that I’m immensely grateful! The more I read this, the more I felt I was there at Tynemouth too. I’ve often walked on that beach with our dog, to exercise the dog! How much more beneficial for us both if I took the time to be aware of my environment, stopped just to be in the moment and to soak up what that fabulous piece of nature can offer. Amazing how just reading your words made me feel that way.